Is online qualitative research as effective as in-person research? 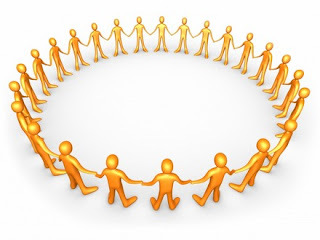 We’ve had some of our long-term clients wanting to explore different ways to “replicate” in-person focus groups online. Surprisingly, this is being driven not only by time and money constraints but also by scheduling conflicts. Although in-person qual facilitates the kind of rapport and connection that is challenging to replicate online, we also believe conducting online qual can give insight – if you use the right methodology and platform for the objective. We currently have a great bulletin board platform (Recollective) we use for gaining in-depth exploration into consumer’s habits and practices – it’s a great tool and we use it often as a supplement to in-person. So we recently renewed our discovery process to review new platforms and we were pleasantly surprised by how advanced the technology has become. Although not perfect, it’s clear that many of them have become more “researcher friendly.” So, while it can seem overwhelming based on the number of options available, we found the following process can help narrow the choices in order to choose the best platform for your needs. Envision the Experience: With so many bells and whistles, it’s easy to get swept away with a lot of the features available. We found as we were doing demos, that clarity was found if we focused on what the experience would look and feel like as we were conducting the study. Decide: Asynchronous or Synchronous? There are pros and cons of each but both can be beneficial based on what you are trying to learn. For example, Asynchronous is great for “exploration” or “going deep” with individual consumers while allowing flexibility for both the researcher and respondents; however, the analysis is typically more disjointed and time-consuming. Synchronous platforms, on the other hand, require a specific “meet up” time. They work well when you want group feedback (ex: stimuli) because they allow data to flow in context – and the analysis is easier. 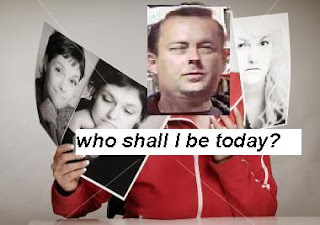 Decide: Text only or Webcam? This is an important step when determining which platform to use because some platforms are better at conducting Webcam interviews/groups (Intervu by FocusVision) while others provide a great Text Chat Group feature (Inside Heads and Visions Live). Again, there are pros and cons to each method that should be carefully evaluated based on your client team’s wishes. For example, Text Chat Groups do not allow you to see and hear respondents while Webcam groups require much more technology requirements. Creating an “evaluation process” not only helped us identify the right platform for the need, it also helped us overcome technology “overwhelm” and create excitement for a shiny, new research tool! We had the pleasure of attending the Qualtrics Roundtable in Dallas for the second year in a row. It was nice to see some familiar faces, as well as meet others who are just getting started with using Qualtrics. There were some great speakers throughout the day. Allison from the American Heart Association started off the Customer Spotlight sessions, by discussing how she uses Qualtrics at her organization. AHA’s use of the survey platform is very different from ours since they are in the medical field - they use it for program evaluations as well as tests for healthcare providers. Brad Boeke from SMU was another customer who was featured, and it was interesting for me to see how Qualtrics can be used in an educational setting. SMU uses the platform to conduct performance reviews of its staff and for school-wide voting. Listening to both of the speakers helped us gather ideas on new types of surveys we can conduct for our customers. The most exciting presentation of the day, for me, was listening to Steve Brain discuss the Qualtrics Product Roadmap. Having used Qualtrics for over a year, I have already seen improvement in the survey and reporting functionality, so I was definitely eager to learn what else they have coming up. The event was a success overall, and I’m looking forward to the new features Qualtrics has coming out in the near future. Mayuri Joshi isResearch Magician at April Bell Research Group, a boutique, full-service marketing research firm, committed to delivering fresh insights you can act on! Learn more at aprilbellresearch.com. A few weeks ago, my staff and I had the pleasure of attending a Qualtrics roundtable event here in Dallas at the Gaylord, and it was great! For those of you not familiar with Qualtrics, it's an online survey platform that enables companies to gather real-time insights. One of my clients has a license to the platform for in-house tracker surveys, but not enough bandwidth to create and run these surveys consistently. So, since we've been helping this client create, monitor, and report results via Qualtrics, it was great to meet some of the faces behind their very attentive support staff. The more we have been using this tool, the more we appreciate its robust capabilities! As we all know, consumers today have a smorgasbord of products, messages and images hitting them every single day. The average American is hit with over 3,000 ads per day! No wonder it's hard for brands to attain brand loyalty. Consumers are constantly being bombarded with the next big thing that's going to solve all their problems and is a "must have"...there's so many choices, how do they choose? And the more important question for brands is: how do you get them to choose you? A recent article published on marketingprofs.com says the key is to focus on building meaningful brand relationships by listening and actively engaging the consumer as they deal with major changes in society and their lives. One thing that marketers are learning is that not only are no two consumers the same, but in today's fast-paced, changing society, each consumer has several different identities that change depending on the context. For example, a marketer monitoring social media outlets may find a person who represents himself one way on Twitter or LinkedIn, may represent himself completely different on Facebook. Most people have several different sub-personas....you have work persona, social or entertainer persona, homemaker persona, super mom persona. So brands must hone in and listen to their consumers. So how do we do this? Traditional research alone is not enough. MarketingProfs.com says effective listening for marketers is an art and with enough detailed attention can deliver unexpected insights. So more than just research and monitoring social media, but through private online communities where brands can get a grasp on how consumers handle change in their lives. Online communities also allow brands to walk with a consumer over time and see what really matters to them. Along with listening, giving them a voice or a platform to express their concerns, and then ultimately seeing that in your product will give them a sense of empowerment that what they say matters. Remember, people want to be understood, and feel important. Bottomline, mastering the art of listening and then engaging the consumer is when he starts to hear his voice and sees himself in your brand. And that's when your brand becomes his brand. What is it about the word “organic” written on the label of a product that makes me automatically want to buy it? For sometime, it’s been trendy to “go green”, but it seems as though now it’s going from trend to becoming a way of life for more and more people. One would think that in the midst of a recession, people would be more concerned with “cheap”, but not the case. According to a study issued by Green Seal and EnviroMedia Social Marketing, four out of five consumers are still claiming to buy green products, and 82% of consumers are buying green despite battered economy. Let’s face it, it’s popular to be “organic” and “sustainable”, and companies need to jump on the bandwagon that voices the environmental benefits of their products. Trendwatching.com calls it “eco-bounty”, which refers to the numerous opportunities, both short and long term, for brands that participate in the epic quest for a sustainable society. Some of these opportunities exist despite the current recession, others are fueled by it, not in the least because of new rules and regulations. Downturn-obsessed brands who lose their eco-focus will find themselves left out in the cold when the global economy starts recovering. Even Apple is jumping on the green wagon, because it knows that most of it’s consumers are progressive, socially-minded individuals. They released the “A Greener Apple” statement to voice concerns and their stance on creating environmentally-sustainable products. The study also claims that one in ten consumers blindly trust green product claims, so basically one in ten buys the green label because it makes them feel good. But those other nine, want to know that what they claim is actually true. I’ll admit that all the hype surrounding the “go green” movement has seeped into my buying decisions as well. I purchase energy-saving light bulbs, shop with reusable grocery bags, recycle when I can and am often drawn to products that read “all natural, organic or sustainable”. There is a lot of opportunity for companies to leverage the environmental benefits of their products to their consumers, because the more people hear about the importance of sustainability, the more they are going to live that way. Go to skittles.com. I promise it will throw you for a creative loop. Tagline is “Interweb the Rainbow. Taste the Rainbow.” This line makes sense when you see the site, because it’s not really a Website, but a social media smorgasbord. Initially, you’ll think you’ve landed on a Wikipedia page, because their Wikipedia page is the background of the Site! To even get permission to view the Site, you have to give them your birth date. Marketing genius! First of all, 90% of people navigate away from a Website within a minute. So if someone takes the time and effort to enter their birth date, their level of interest in learning more about Skittles must be fairly high. Second, by requiring people to enter their birth date, Skittles can determine what age demographic their products reach. 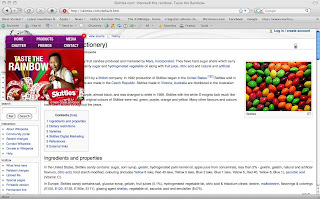 As you surf the Skittles site, it uses various online social marketing tools to pull up information about Skittles. For example, when you click on the Media tab, it pulls up videos via the YouTube site, and photos via Flickr. When you click on the products tab, it takes you to the product description on their Wikipedia page. Again, marketing genius. This bold move is risky, because by turning their Website into a social media hub for skittles, they lose a lot of control. For example, whenever someone twitters about skittles, its shows up in their twitter stream. That means if someone twitters something negative, that’s right-it shows up in its Twitter stream. But this site is causing buzz, and buzz, aka word-of-mouth, is marketing heaven. Looks like the Skittles rainbow is on its way to a pot of gold. Which Websites will Win in 09? With so much going on in "online social networking", I find it difficult to know just where to spend my time online. It's one more thing that has been added to my list as a B2B marketing tool. So, I found this article in the NYTimes helpful. It gave a perspective on the sites that will most likely have staying power in the months to come. Although the audience was meant for IT professionals, I found it applicable as a market researcher, or anyone who wants to keep up with the latest business trends. Carolyn Duffy Marson, Network World, IDG wrote the article on December 31, 2008, titled: "Nine Web sites IT pros should master in 2009." She claims: "Master these Web sites, and you’ll prove you can innovate during the most trying economic times. And you’ll do it more efficiently than your 20-something employees, who waste too much time chasing the new, new thing on the Internet that may not survive the downturn." Top of the list was LinkedIn while Facebook was discounted. If you're interested in seeing the full list, you can view it here at the NY Times site.